« True Conversations: Lost souls. Summer gridlock. “Curiouser and curiouser!” What about the Google map of our town? Ocean Grove, New Jersey 2019. © Google. Click to enlarge. This is by Lewis Carroll, Alice’s Adventures in Wonderland and Through the Looking Glass. a. Since when are research maps marred by advertisements? Notice the Asbury Beer Hall and the Arts Center in Ocean Grove. Regarding the latter, where the Heck Avenue is the Great Auditorium? c. The streets along the Lake, OG side, have no names. What happened to Lake Avenue, that infamous walkway/official street? How about Main Avenue? d. The North End Redevelopment Area seems to be carved out and made part of Asbury. 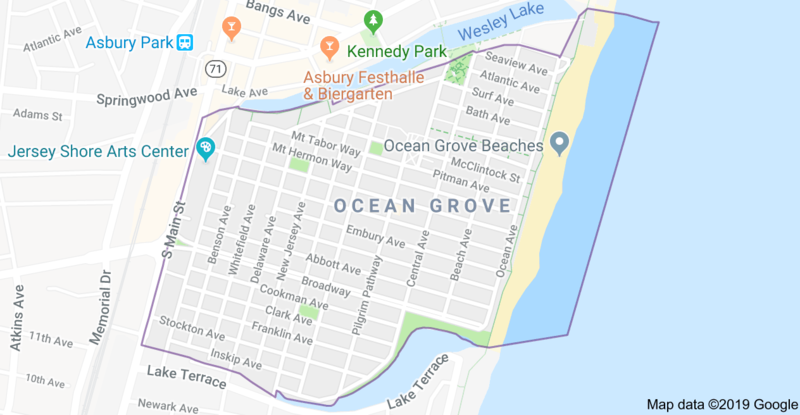 e. What about the extension of Ocean Grove into the Ocean? Does that eastern boundary presume to say something about ownership of the Ocean? Or what? Jack?? BUENA VISTA SOCIAL CLUB “Veinte Anos” Are we speaking the same language in this town? This map should be considered a fraudulent map. The official map of OG is the tax map. All other maps should be the same, and consistent with the tax book, but they are not, because we have a dysfunctional Township Committee in matters of Land Use. According to this map it’s not just the ‘area in need of development’ that’s been ceded to AP. It looks like the walkway known as Lake Av and part of Founder’s Park (original name was Thompson btw) has been ceded as well. I thought the official northern boundary was the middle of the lake/detention basin. Oh well.